SETTING LOADING DOCKS FREE SINCE 2002. Welcome to Dockzilla, where loading docks are untethered from facilities for extreme business advantages over the permanence of concrete. This unbridled mash-up of portability, structural integrity, and pre-meditative engineering anticipates what can happen at the loading dock, so our customers can focus on what they do best. Our equipment is designed to withstand the rigors of trailer and forklift impact, yet can be easily removed or relocated to another facility when needed. 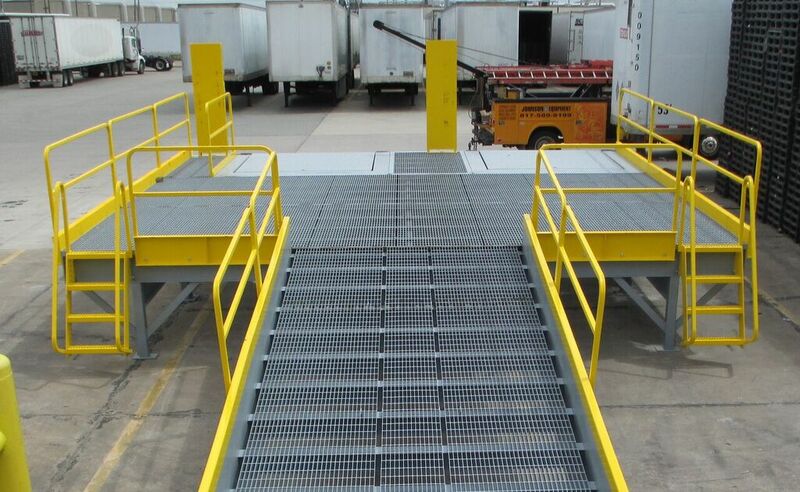 Check out our lineup of portable loading docks, ramps, platforms, safety barriers, railboards, and more. It’s time to unleash your loading docks. It’s time for Dockzilla. The producers captured our passion for engineering and manufacturing modern loading dock equipment. This “relentlessly-inventive” approach differentiates Dockzilla from commodity forklift loading ramps and traditional concrete construction in many ways. A Portable Loading Dock is used by this heavy equipment manufacturer to withstand bulldozer tracks during loading. Because these vehicles specialize in obliterating rough terrain, this loading dock ramp is comprised of easily replaceable wooden planks vs. steel decking that would be cost-prohibitive to replace as often. A great survival tool for working outdoors year-round, the Adjustable Loading Dock helps this energy company efficiently and safely unload trailers during tough Minnesota winters. Serrated bar grating amps up tire traction to keeps forklifts from sliding down the ramp and protects against icy build-up by allowing the snow and rain fall through. Easily adjustable front legs accommodate variations in trailer heights without having to make major changes as new loads arrive. The High-Capacity Implement Loading Dock was deployed by this military base to off-load oversized vehicles that arrive on flatbed trailers. Despite its hefty frame, this mobile loading ramp features solid wheels designed to support massive loads, and for repositioning anywhere on the property. Architecturally-sound and relocatable loading dock. Bolts to building exterior to save inside floor space. Removable, stackable barriers safeguard railcar docks. Configured to load construction, agricultural, and military equipment. Widest loading deck manhandles oversized loads. Reduces unloading time and keeps trucks on the road. This world-class science and engineering-driven consumer products company doubled its capacity with two Dockzilla Impactable Yard Ramps positioned side by side. These dual manufacturing loading docks, which were built at 96” to match the width of the trailers, hit the ground running after installation at the existing grade-level facility, providing two loading dock positions. 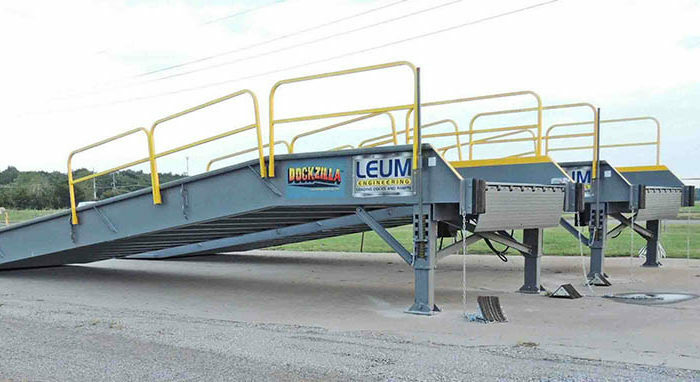 The Dockzilla Impactable Yard Ramp’s standard safety features – tall side curbs, handrails, wheel chocks, and an integral dock leveler – sealed the deal over multiple competitive quotes. Currently operating in a grade-level building without loading docks, this customer needed two viable loading dock positions. Looking to avoid downtime and costly permanent construction at a leased space, the customer and their architect tapped an alternative to traditional loading dock construction with a 22’ x 20′ Dockzilla Self-Standing Platform. This freestanding utility loading dock solution platform was large enough to turn and maneuver two loading dock positions and was installed inside the building to maintain security and environment control, and to keep trailers level. Although self-standing, this heavy-duty unit provided a robust loading dock option with key standard and added features, including Safe-T-Lip levelers, Dok-Loks, shelters and doors, full guarding, and impact barriers. For access, a 30′ long x 8′ wide ramp and dual dock ladders were provided. Receiving their platform within several weeks enabled the customer to begin operations on their schedule without the typical delays caused during construction. This world leading manufacturer of agriculture equipment is engaging the Dockzilla Impactable Yard Ramp to reduce material handling time and gain additional loading capacity. Customized at a high capacity 12’ width to accommodate expansive equipment, this moveable agricultural loading dock ramp helps reduce the time forklifts spend transporting product from storage to the company’s permanent agricultural loading docks.